Dr. Renee Baggott graduated with an Associate of Applied Science in Electronics Engineering Technology from Durham Technical College, a Bachelor of Science in Physics from North Carolina Central University, a Master of Science and Ph.D. both in Physics with an emphasis in Optical Physics from Hampton University. Her graduate work focused on holographic data storage in cylindrical photorefractive crystals and tropospheric lidar. Research experience includes working at Duke University’s Free Electron Laser Laboratory as an electronics technician and as a summer undergraduate research assistant in the Molecular Beam Epitaxy Laboratory in the Department of Electrical Engineering also at Duke University. She participated in an internship at ITT Industries System and Science Division working on receiver development for Hampton University’s ozone and aerosol LIDAR systems and worked as a member of the Laser Risk Reduction Team at NASA Langley Research Center. Outside of academia, she is a volunteer with Healthy Families partnership, tutors elementary and middle school students in mathematics. Renee has also taught undergraduate physics classes. Recently, she was recalled to active duty with the Navy to serve in Afghanistan. While there her positions included acting as the officer in charge of the Female Engagement Team (FET), Training officer, Command Emergency Response Program (CERP) manager as well as truck commander and gunner. She was awarded the Bronze Star for her actions in support of combat operations. She is currently an Assistant Professor of Mathematics at Hampton University. She is a recipient of a Non-Traditional Careers for Women Scholarship and an Alliance for Minority Participation scholarship. She was an Office of Naval Research Fellow and a Virginia Space Grant Fellow. 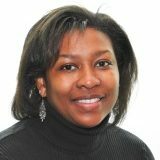 Her professional memberships include: Sigma Pi Sigma National Physics Honor Society, Alpha Kappa Mu National Honor Society, Virginia Academy of Science, Optical Society of America, National Society of Black Physicists, the American Physical Society and a member of Delta Sigma Theta Sorority Inc. She was awarded a NASA New Investigator Research grant.